Vegetarian was the theme of this Taste of Home Cooking Recipe Swap. Even though I am no longer a vegetarian, I still enjoy eating vegetarian and in some cases I even prefer vegetarian meals, especially when talking about soups. If I'm going to reheat something for lunches for 4-5 days, I'd much prefer it be vegetables, and not meat. The blog I received in the swap was Hezzi-D's Books and Cooks. I knew immediately that I'd have a hard time deciding what to make - her blog has a lot of great vegetarian recipes. I browsed for a while, torn between pasta, tofu, or soup. The day I decided to cook for this swap it was pretty cold and blustery, so soup it was! I chose this Broccoli Cheddar Soup. I read through the post taking note of Heather Lynne's suggestion on how to add the cheese without it curdling or turning chalky. I usually do remove my pan from the heat before adding cheddar, but now I know that you should probably wait a while before adding the cheese - cheddar melts at 120 degrees F and curdles at 160 degrees F. I pulled out my meat thermometer (how ironic, right?) and waited until my soup cooled to about 130 - this took more than 10 minutes. I then slowly added the cheese and stirred it until it melted. My soup was creamy, smooth, and didn't have any of that chalky consistency you can sometimes get with cheese sauces or soups. I've had broccoli cheddar soups before, but what made this one different for me was the use of the herbs. I loved the flavor the rosemary added and really think the soup would not be the same without it. Thanks for sharing your blog in this swap, Heather Lynne! Add the onion and saute for 4 minutes. Add in the garlic and saute for an additional minute. Stir in the flour and herbs and heat for 30 seconds. Add in the milk and cream and whisk until smooth. Bring the soup to a simmer and add in the potatoes and carrots. Cook for 10 minutes. Increase the heat and add in the water (broth), salt, pepper, and butter. Once the soup is boiling add in the broccoli and reduce heat to a simmer. Remove the soup from the heat and allow to cool for 2-3 minutes (I allowed it to cool for 10). Slowly stir in the cheddar cheese until the soup is smooth. Serve hot. One of my favorite soups....makes me want a big bowl right now! 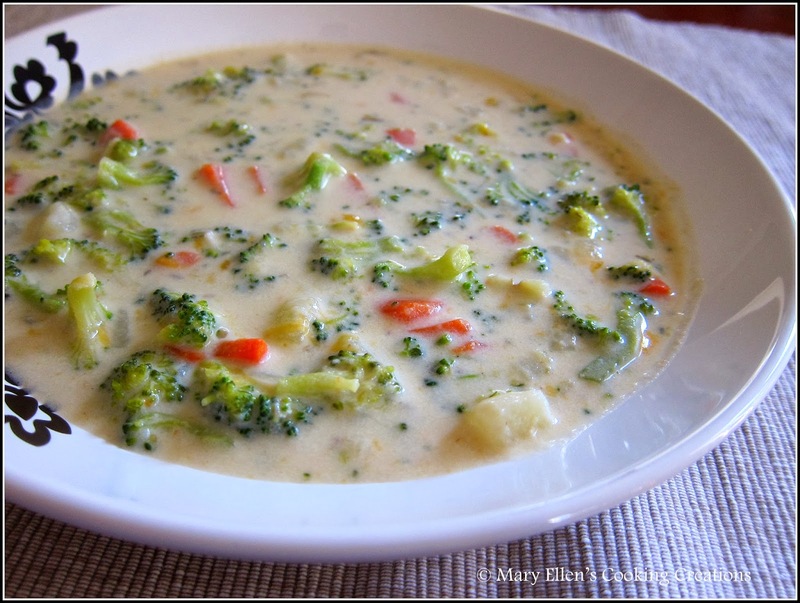 This is one of my husband's favorite soups, looks great! I love soup! This looks perfect! 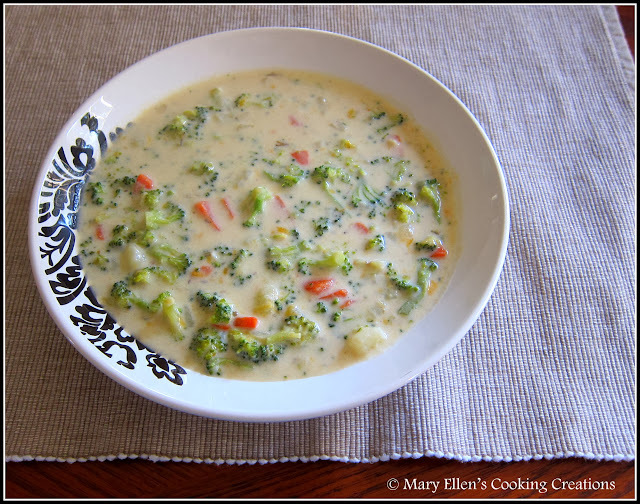 I have been wanting to make a version of broccoli cheddar soup at home, this looks like the version to try! Yum! No kidding...I didn't even think about the cheese causing the chalky consistency in soups. I made broccoli cheddar soup this week that was a bit chalky so this explains it - I didn't wait to add the cheese. This recipe sounds great! So glad you liked it! This is one of my favorite soup recipes. I had no idea you could prevent the weird cheese consistency in soups! I'm now very intrigued to try this out.